Dan Jones is Theatre Manager in the Department of Technical Support Services, supporting the School of Arts and Creative Industries. He is the technical manager of the Edric Theatre and studios. He specialises in theatre production and design, with interests in lighting and sound. He has worked professionally in the theatre industry since 2003, alongside work in theatre training at a number of universities. Dan’s professional work has been in a range of theatrical and live performance disciplines. He has worked in varied roles including Technician, Lighting Designer, Sound Engineer and Production Manager. Dan continues to work freelance for occasional industry projects. 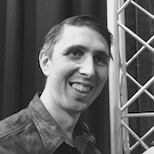 Dan has previously taught modules in Lighting and Sound, Technical Management, Computer Aided Design and Set Construction.